As promised earlier, here’s another brand new set of mad libs for kids! We know how much you absolutely love these worksheets, so we’re working hard to keep up with demand! 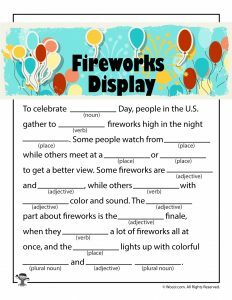 These 4th of July mad libs are perfect for summer fun activities such as sleepover games, rainy day games, and especially travel games for kids! We all know that mad libs are a great way to teach parts of speech, but kids just think they are hilarious and fun. Plus, you’re sneaking in language arts skills over summer break! You will probably also love our summer mad libs, too!